Years before the Big Three (or Four, depending on who we’re referring to here) and the hit-or-miss formula of signing a super team, (ahem, Brooklyn) the idea of a basketball powerhouse was an excusable one. 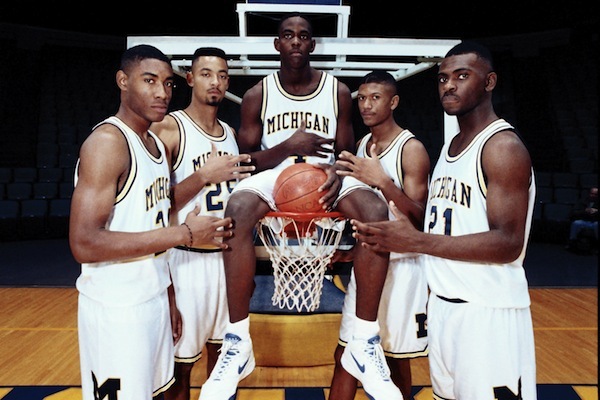 There was no such thing as players coercing each other to go to the same organization at the professional level, let alone the collegiate level – yet through careful strategic recruiting, the 1991 University of Michigan’s incoming freshman class remains the greatest recruiting class ever, as noted by ESPN journalists and elite basketball historians – otherwise known as the Fab Five. Detroit natives Chris Webber and Jalen Rose, Chicago’s Juwan Howard, and Texas players Jimmy King and Ray Jackson were all listed in the nation’s top ten high school prospects, save for Jackson, who was named No. 84. 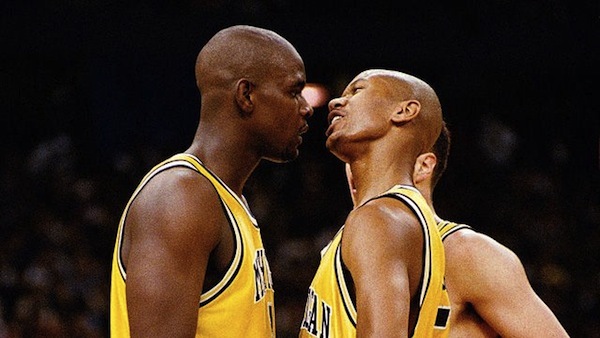 The chemistry between the boys was uncanny; before long, Wolverines’ head coach Steve Fisher was starting all five freshman in Michigan contests, landing in consecutive NCAA Men’s Division I Basketball Championship games in 1992 and 1993. 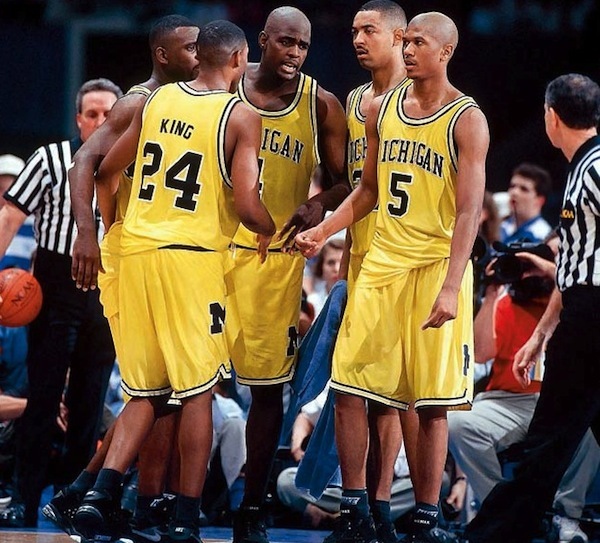 Though losing both championships will forever be a stain on the Fab Five’s tenure as Michigan Wolverines, it was what happened in-between the tip-offs of the season openers and those championship games that resonates not only within Michigan basketball history, but even within the NBA. All you really have to do is look at today’s players during a game: the baggy shorts, the typical short, bald fades most players rock, to the black on black socks and shoes combo, to the arm sleeves and long compression shorts; hell, I’ll even throw tattoos into the list, because while today’s players aren’t directly mimicking what the Fab Five wore, they are emulating the mental and cultural paradigm shift those boys kick-started going into Michigan. For one thing, the best and arguably most entertaining starting five in D-1 basketball at that time were a cluster of kids straight out of the ghettos, that brought their blacktop, doin’-it-in-the-park brand of street basketball, complete with trash-talking and inner-city hip-hop music , into a collegiate setting – we’re talking the Dukes, North Carolinas, Notre Dames – all these prestigious schools were now honing their attention to five 18-year-olds sagging their shorts and gettin’ buckets. But here’s the catch: the university loved it, at least from a marketing standpoint. The entire Wolverines organization and school certainly saw their share of hate mail, but they were winning and making money, so at what point does hate mail still hold their sting? The Fab Five singlehandedly brought to light a whole different side of basketball that most elite level folks had never seen: a style of the sport that was flashy and highly-entertaining, soaked in with trash-talking that added just the right amount of drama to these games. Their street-style of basketball brought hip-hop into basketball culture simply because at that very same time, hip-hop was also making it’s mark outside of it’s respective culture and environment and providing the soundtrack for the Five’s adolescence: A Tribe Called Quest was in their prime and working with Native Tongues on the east coast, where West Coast hip-hop and gangsta rap was on the cusp of what it became a few years later with the emergence of Tupac Shakur, Snoop Doggy Dogg, and Ice Cube. Compared with today, an NBA commercial wouldn’t be an NBA commercial without a 2 Chainz song to back it up; 2K Sports, one of the largest manufacturers of NBA video games, wouldn’t put so much effort in conjuring the right hip-hop tracks for the game’s soundtrack. Dr. Dre’s Beats headphones are thrown onto every NBA player’s head, from Lebron James to Dwayne Wade and Derrick Rose. Basketball players are rubbing shoulders with rappers and vice versa – wasn’t it Drizzy who said that music and sports are synonymous, “cause we want to be them, and they want to be us”? 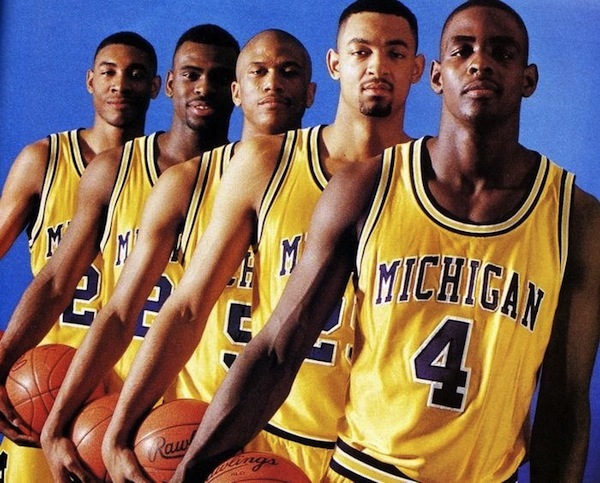 Disregarding all politics and scandals that ran behind Michigan’s closed doors while under the Fab Five legacy, the greatest recruiting class to date changed the world of basketball, as they knew it, forever. Forget about the baggy shorts and Ice Cube for a second, and take into the consideration the mentality these players had going in and coming out of Michigan, mainly how their success and how they dealt with it paved a whole cultural shift within the game and the associated business. What began as a culture of the game traded itself in for the culture of the player: marketing schemes, image, individuality and creating their own identity, all came to light the second the Fab Five talked Coach Fish out of having them wear the John Stockton shorts and pull on their signature baggy shorts instead. Throw in the integration of hip-hop piggy-backing on the Fab Five, and what started as a generational soundtrack for five kids out of the ‘hood turned into the soundtrack for the global business that is the NBA and everyone that consumes it. Entertained by what you see on tonight’s game? Thank the Fab Five for that.